Are you aware of how much your salaried employees cost you hourly? This isn’t a trick question where I’m expecting you to factor in opportunity costs and pizzas. 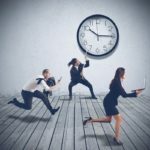 When it comes to hourly people costs, employers will often be very witty about how to save time, gain efficiencies, minimize useless meetings and win-wins. However, with salaried employees, the focus on efficiency is just not there in the same way. Do you have time for lunch with your salaried employee, but not your part-timers? That may not make as much sense as you think. From a basic rate, you can then factor in the annual cost of additional items it takes to support each employee and divide that by 2,080 to add to the hourly rate. Every company has its own nuances and staffing needs and commitments. It’s not always a time/money equation. However, if you the employer are in touch with EVERYONE’s hourly rate, whether they are contractors, full-time or part time employees, I believe you can manage in a more consistent and logical way.